I have updated my game Not a real question, originally announced on Meta Stack Overflow, to retrieve the game questions via the API. It's easy: After having chosen a site, you'll see a a button labeled "Play". 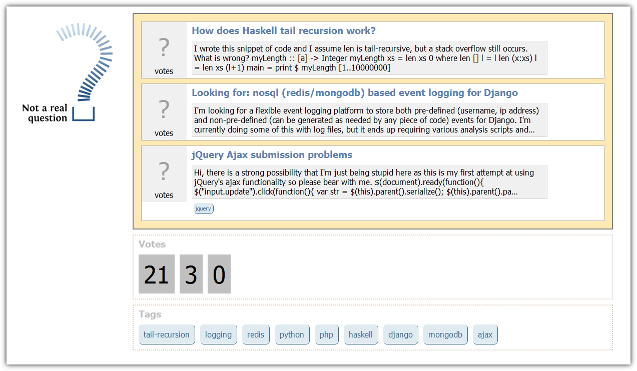 As soon as you click it, you will be presented with three questions from the Stack Overflow family site of your choice. Unfortunately, there has been a mixup in the database, and the backup strategy… well, let's just say it could have been a tiny little bit better. So you have to help. You have to find out which of the given tags, text excerpts, and vote counts belong to which question. Use your mouse to drag the tiles to their correct places. As soon as you have a plausible solution ("plausible" doesn't mean much – just that each question has a vote count, a text excerpt, and 1 to 5 tags), you will see a large button labeled "I'm done!". If you are done, you click it. And let's hope you sorted things out correctly, because the evil hyphen site is just around the corner to fight you in the grand finale. Or not. Not a real question used to use the data dump for creating games; now it retrieves questions through the API. This obviously means that more sites can be supported. So in addition to the four Stack Overflow Trilogy sites, you can also play a game with questions from Cooking or Gaming. I will enable other sites (any site that supports the API can easily be added) as soon as their question numbers have reached the neccessary threshold to create games. Please note that since Not a real question now relies on external data – which is also not as easily queryable as the data dump –, creating a new game may sometimes fail (this is especially true for Cooking, because this site is on the very bottom end of the above-mentioned threshold). So don't worry if you're given the error message that no game could be retrieved – just try again, now or later. Not a real question runs on the Python runtime of the Google App Engine. Not a real question is created by Benjamin Dumke. Note that this is a free-time project of mine, and has nothing to do with my employment at Stack Overflow Inc (in fact, the previous version pre-dates my employment). See my profile for contact details. Am I the only one who can't play?